Friday evening at the Christmas Fayre was A-MA-ZING!! The atmosphere was incredible as we were overwhelmed with the volume of visitors who all came out in support of this increasingly popular PTA event. The choir sang beautifully; Santa's grotto was magical; people were falling over themselves to win at the many tombolas; mulled wine, samosas, hot dogs and pulled pork baps were selling like hot cakes.....and the cake stall rivalled the Great British Bake off. Hand made gingerbread biscuits sold out in minutes at the Fair Trade stall; Buddy received a Christmas dinosaur from Santa and there were fun and games at every turn. 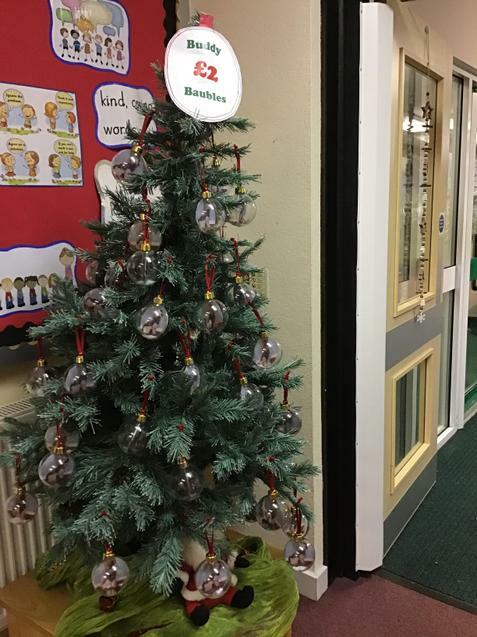 Buddy baubles are still on sale in school, so if you missed out and would like to purchase one, please pop into the office- they are £2 each. I am delighted to announce that St.George's house were the winners of the 'best dressed' house stall, with PTA judges also commenting on how engaged the children were. In fact, all four house stalls were a roaring success. It was a great idea and potentially the start of a new tradition. The community feeling generated was one of warmth, generosity and collaboration. I can't thank the PTA, staff and children enough for all their hard work in creating such a successful evening, as well as all the families who turned out in support. The total funds raised is yet to be finalised but the atmosphere and sense of community was priceless. Thank you again to each and every one of you who contributed. I feel like it was our best one ever!